This article was created for individuals who decided to become a welder in South Carolina. Here you can find not only a list of the best welding schools in the state but also some additional info. Learn about welding basics, methods, job opportunities and salary options. 1.5 Where Can Certified Welders Work in South Carolina? Before making your final decision, it’s a good idea to learn about some basics of welding. It will help you to understand this profession better and make an objective decision. That’s why we’ve prepared for you some useful info so you can learn more about welding. It’s clear that any career requires some specific personality traits and, of course, welding is no exception. There are some traits that are absolutely essential if you want to be a good welder. Of course, you may not meet all the requirements but it shouldn’t disappoint you. You can improve yourself and develop the skills you lack off so just work hard. Welding – it’s a process of joining metal pieces together with the help of heat and fire. Welders use various methods and tools to perform their job but still, they don’t need any additional materials. At the same time, there are soldering and brazing that is pretty similar but they require some additional elements that are called fillers. Also, soldering and brazing require 850 degrees Fahrenheit or lower heat while welding requires higher temperature rates. You should know that brazing allows creating stronger constructions then soldering. If you want to become a welder, it’s not enough to complete your training. You need to pass some tests to get your certification. All the certification tests are designed by the American Welding Society (AWS). Of course, it’s only some of the welding methods as there are more than 100 of them. At the same time, the most widely used methods are Stick, MIG, and TIG. Where Can Certified Welders Work in South Carolina? There is the whole bunch of industries where certified welder can work in South Carolina. 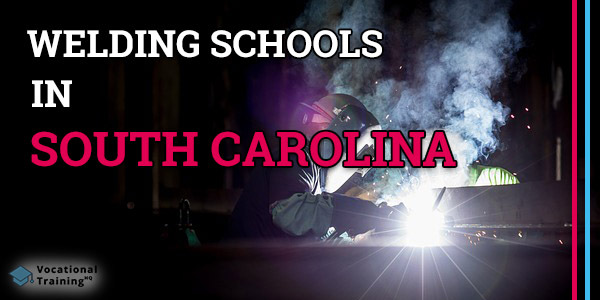 There is a list of the best welding certification schools in the state of South Carolina. In total, there are 22 schools that are approved by the American Welding Society’s SENSE Accreditation Program. Each school from the list provides such classes as Gas Tungsten Arc Welding (TIG), Shielded Metal Arc Welding (stick), or Gas Metal Arc Welding (MIG) and others. The main requirements is a high-school diploma or GED but there are some schools that accept high-school juniors. To begin with, there are only a few underwater welding schools in the USA. In fact, there are only 9 of them and one of these schools is located in the state of South Carolina. To begin with, you should know that welding has an amazing outlook in South Carolina. According to the US Bureau of Labor Statistics, the number of job offers for welders will grow by 6% by 2026. A median welder’s salary in South Carolina is about $42 060, while throughout the country it’s about $39 390 per year. If you’re interested in welding, you may also like some other technical careers. Most of the schools from the list above offer a number of other training programs. It means that if you aren’t interested in welding but look for similar options, you may find a bunch of similar options. Welding is a dangerous job and there are lots of safety rules that welders should follow. Read all the instructions properly. There are a number of important warnings in equipment manuals and reading them, you can guarantee your safety and prevent a number of accidents. Buy high-quality welding gear. It’s important to use the best auto-darkening welding helmet, gloves, glasses, jacket, and shoes. Also, don’t forget to protect your skin from heat properly. Be mindful of the environment. It means that you should keep the area clean, tidy, and well-ventilated. We hope this article was really helpful for you as there is a bunch of useful info. Also, you can use the welding schools list to find the program that suits your needs most of all. Just make sure you’ve learned all the info and start your path to your successful career.